What Really Happened to the Franklin Expedition? The 3 Seasons of Travel: When it's Best, and NOT Best, to Go! The white and blue wooden ferry glides smoothly on the water of the Indian Ocean, which looks ever clearer as the boat approaches the coast. The skyline of Malé, with his pastel-coloured, multi-storey buildings and the golden dome of the Friday Mosque, appears in the distance, as if emerging from the blue mass of the ocean. Malé, the capital of the Maldives and one of the most densely populated cities in the world, occupies one of the 1192 flat, coral islands that make up this South Asian country. Our dhoni, a local ferry, is crowded with Maldivian businessmen in suits and ties, gazing toward the city, lost in their thoughts in the afternoon heat. The captain, a middle-aged man with an elegant figure and a short, grizzled beard, chats casually with his younger colleague while steering the ferry to port. Nearly all other tourists have been picked up at the airport by private speedboats sent by their resorts. For me, however, this is not a typical luxury holiday in the Maldives. I am not planning to sleep in a floating villa for $1,000 per night, nor will I walk on a wooden bridge over the ocean at sunset. Instead, I am going to stroll into the intricate streets of the local islands on which Maldivian residents live. These islands are so close to the private ones, and yet so far from them in the way of life, that they might be as well considered worlds apart. Malé is different from the other islands of the Maldives. It’s not surrounded by crystal-clear shallow water, delimited by a stripe of white beach that runs along its borders and shines under the sun; nor by palms, under which local men and women sit on chairs made of nets and iron bars. Malé is a colourful chaos of mopeds, cars and people who mingle all together in the narrow streets, between tall buildings and the shadows of trees that appear behind the walls of traditional coral houses. “You have to be determined, otherwise you’ll never pass through,” says Arcelle, a young Filipino woman with long dark hair and a constant, bright smile who’s been living in the city for several months. “Malé is very crowded; the streets are narrow,” she says while walking down the street between parked mopeds and a taxi. The latter is driving so slowly that it is being overtaken from the right by a mother walking with her child at hand. The island is not quite six square kilometres, yet home to 130,000 people. Arcelle came here to teach English to primary-school children, and now hosts couchsurfers in her one-room flat. The official Couchsurfing.com network has only recently spread into the Maldives, and at a slow pace; in 2009, former president Mohamed Nasheed changed national laws to allow tourists to stay overnight on local islands, breaking the stronghold previously held by exclusive luxury resorts. Since then, platforms such as Couchsurfing and Airbnb have gained popularity, along with a rise of social media. The Internet has found its way even to the smaller islands. 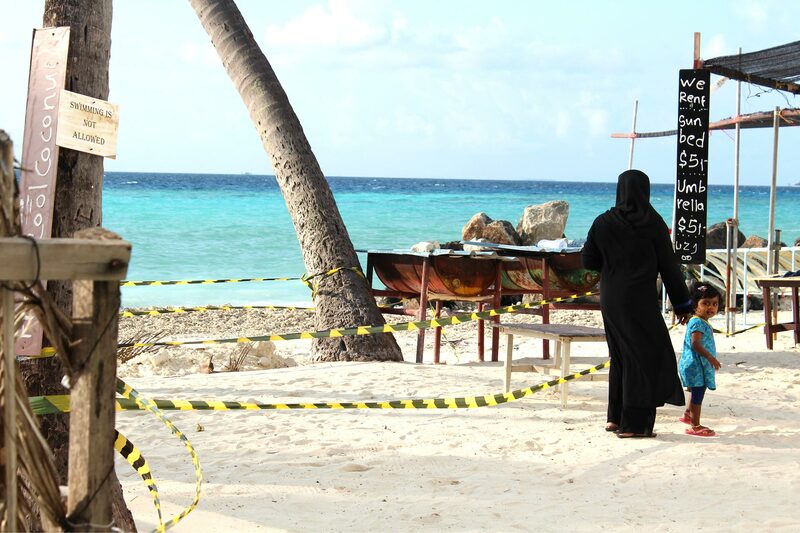 On Gulhi, a 90,000-square-metre island in the same atoll, it is common to see groups of young women dressed with long black dresses and veil, sitting in the evening at the only open café, drinking coffee and chatting over their smartphones. 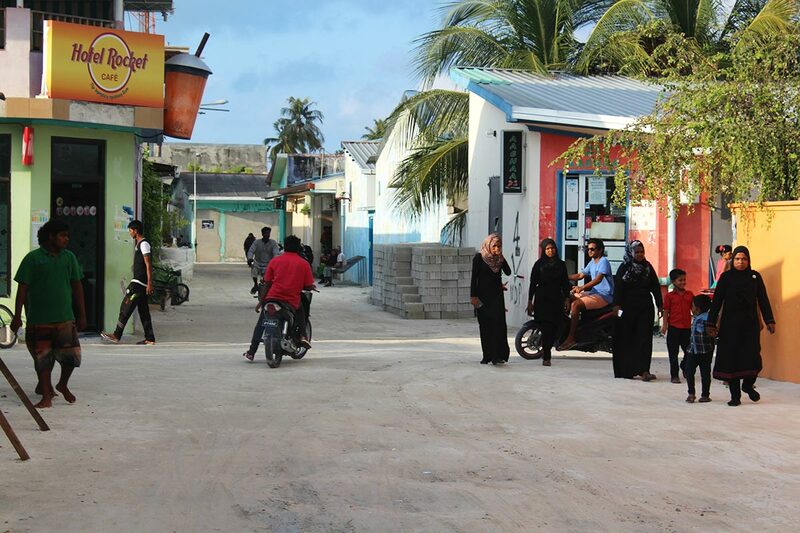 The narrow streets of Gulhi. According to the World Bank, around the half of the Maldivian population uses the Internet. This number will surely grow: in the geographically fragmented and rather conservative society, new technologies offer entertainment, communication and a way to connect private citizens with potential visitors, boosting young tourism entrepreneurs on inhabited islands. While Arcelle guides me through the city, the chant of the muezzin fills the streets. “Shop hours are a bit complicated—I still haven’t figured it out fully,” she says. Shops must follow the prayers’ timetable: they close during prayer’ time. The Maldives are a Muslim country, and sharia is applied together with the local law. For tourists on the populated islands, this means bikinis and swimwear are only allowed on distinct “bikini-beaches,” while consuming alcohol and pork is not allowed. But this does not apply to the private islands of the resorts, where travellers can enjoy a margarita while sunbathing, nor to boats on the sea. This is why there is a boat anchored in front of the local island Maaafushi, called the “floating bar.” The bar picks up customers—Maldivians are not supposed to visit such places—on the island and brings them back for free. A bar close to the airport is also allowed to serve alcohol, the only one in the whole country. A young local man tells me, however, that there are illegal ways to find booze on the local islands, if one has the determination and money. 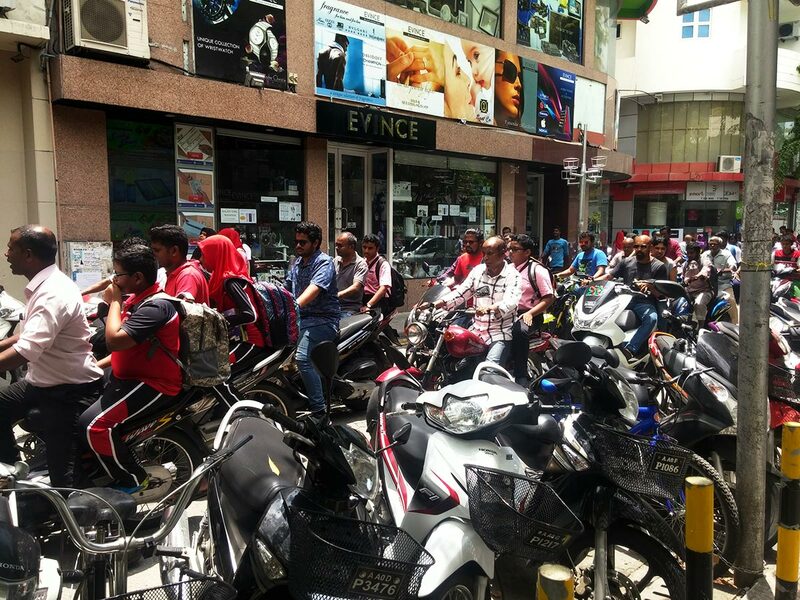 Scooters clog the streets of Malé. On Malé, there is no bikini beach. Arcelle’s favourite leisure activity right now is to go explore nearby islands. “Tomorrow we are going to annoy the guard of a private island, if you want,” she says. I look at her quite perplexed. A few days ago, she recounts, she was trying to reach, with local friends who own a small boat, a private island with a desert beach. Their plans were disrupted by a security guard, who yelled them to leave. Having succeeded in starting a conversation with the man, Arcelle felt like they might eventually become friends. There aren’t many leisure options on local Maldivian islands, apart from enjoying the untouched beauty of the sea. There are cafés, small museums, massage parlours, and, in Malé, a cinema that shows mainly Hindi or local Dhivehi-language films. An independent journey to the Maldives is a journey into nature and, for some, into a quite different culture. “Oh, don’t worry, just keep about a metre distance from it,” says Zacharia (not his real name), smoking a cigarette and fixing the boat to the ground in the shallow water, while I point at the black fin that is slowly coming toward us. It still confuses me, how we can stay a metre away from a black-tip reef shark when we both are in the water. However, Zacharia looks relaxed—and he is in the water too—so I decide to trust him. The shark, a young exemplar of just over a metre long, seems to be merely curious and swims away to the other side of the shallow lagoon. It is good, I think, that the water is clear, nearly transparent. You can see the sharks coming. “Here they never bite, they don’t attack,” Zacharia tries to reassure me while I decide to sit down on this strip of white sand surrounded by the ocean, and wait, rather than go snorkelling over the corals of the nearby reef. But he can convince me to come back into the water—partly because there is not much else to do on a sandbank. 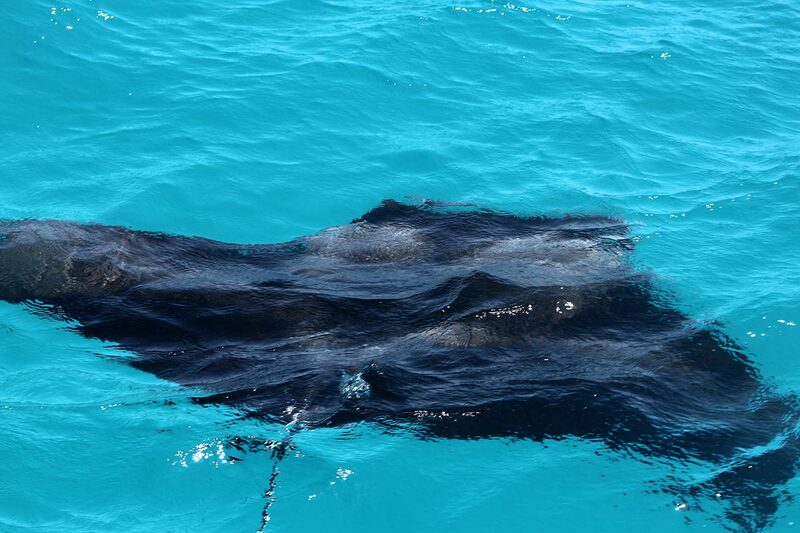 Tourists can swim with manta rays in the clear Maldivian water. When you surpass the shallow water that lets the sand shine in pink reflections, and pass over the colourful corals, fish and anemones, you find yourself on the verge of the reef, of a dark blue gorge, apparently bottomless. It is a thrilling feeling, nearly a vertigo, for which many tourists are willing to pay. Zacharia knows that: he has been bringing independent travellers to the sandbank since he stopped working in a resort, a few years ago. “Many people here now work some years in the resorts,” he says. “They learn how to work with tourists, and then go back to their islands, and start their own touristic business.” Zacharia is quite young. His curly black hair falls on his forehead while he puts back the beach umbrella he’d planted for me in the middle of the sandbank. While we go back, he lets me try to drive his homemade, two-seater boat. He also writes his contact number on a piece of paper: a makeshift business card, so I can recommend him to other travellers. Zacharia is always looking for new clients, but when I tell him that I work as a reporter and would love to write about the Maldives, he turns thoughtful and asks me not to use his real name. The same happens with nearly all other Maldivians I speak to. To understand why, you need to understand the Maldives’ current political climate. President Abdullah Yameen recently issued a repressive defamation law, which condemns not only defamation against politicians but also statements against Islam and social norms. Critical journalists regularly face intimidation, even arrest. One blogger has recently been killed and another journalist has disappeared, both in foggy circumstances. Freedom of expression is also threatened by growing religious extremism; radical groups have been linked to harassment of bloggers and journalists. Reading about these issues only goes so far. For foreigners to understand the political and cultural shyness of everyday Maldivian people, it is necessary to go beyond the sunny, laid-back image of the country advertised on tourism pamphlets. Visiting the Maldives today shows how much the country has changed in the past few years. New bed and breakfasts, hotels and restaurants have been popping up even on the smallest islands. 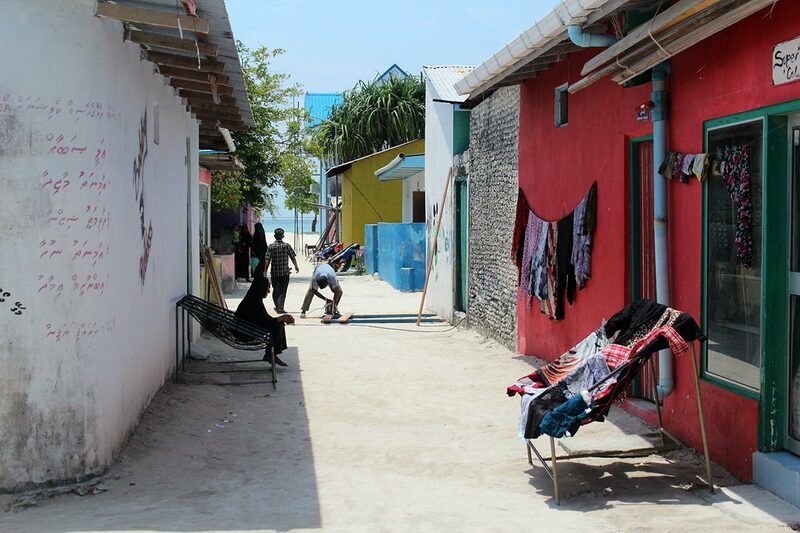 Gulhi, not even a square kilometre, now has five guesthouses. Prices on Airbnb can fall as low as $24 per night. Eating and moving with local ferries is not expensive. Two to five dollars are enough for a meal, such as fish curry or the traditional tuna with coconut and flatbread, or for a short ferry ride. 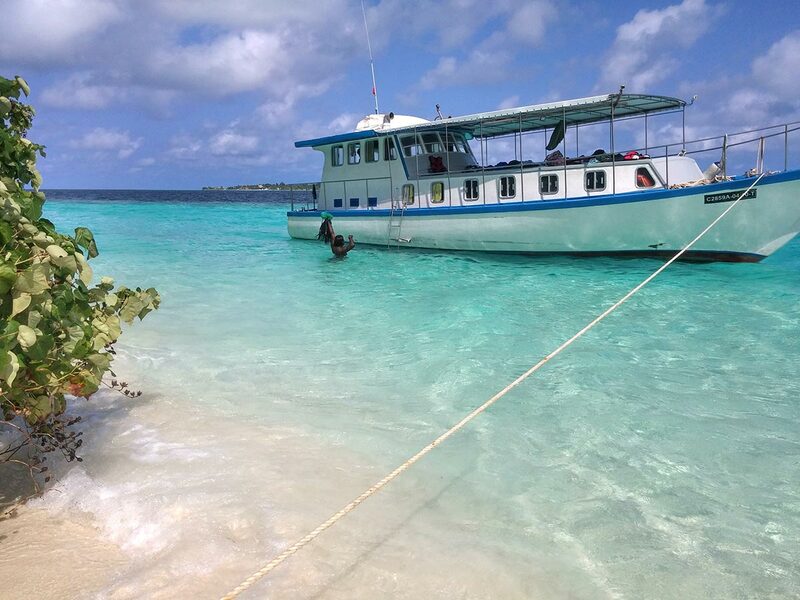 While private islands are sold to investors from all over the world, private citizens are gaining new financial opportunities through local tourism. It’s not surprising that former president Mohamed Nasheed is still so revered by many. “He was like Mandela,” says an older resident who brings tourists on sea excursions for a living. The former president, the first one democratically elected after 30 years, had to resign under troubled circumstances and was arrested in 2015. He has since been granted asylum in the United Kingdom. 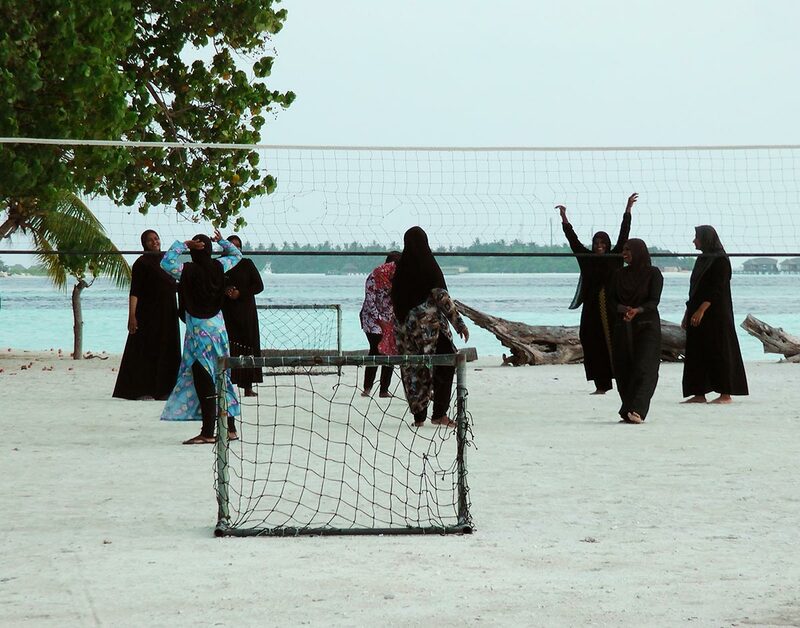 Local women play volleyball on the beach. The older man complains about the current political situation. He feels the democratic achievements that had been reached with the first democratic elections in 2008 are now dwindling. “Before, people used to wear T-shirts with the colour of the party they supported during elections. Now you risk being bullied.” His perception reflects the social and political climate in the country. Poverty and criminality plague the Maldives—the current president, Abdullah Yameen, is under pressure after reports of corruptions tied to the sale of private islands came to light one year ago and has turned increasingly repressive against critics. Human-rights organisations are concerned, as the government recently reinstated the death penalty, breaking a 60-year-old moratorium. Still, most tourists are blissfully unaware of the political troubles unfolding in the country. The islands, each of which has its own distinct character, offer a generally relaxed atmosphere—quite different from the chaotic Malé. As a foreigner, one might think that life here proceeds slowly, while you sit on a chair in the evening watching women collecting herbs and children playing football in the fading, orange light of the sun, which disappears slowly on the line of the horizon. But this idea is wrong. On Maafushi, a tourist, popular island in the Malé atoll, the hotel owner Imran (also not his real name) says that “things are changing very rapidly right now.” He remembers, a few decades ago, when the island only had a handful of streets and no electricity. Tourism can be challenging to the local islands, but it is also bringing benefits. “Hotel owners are organising themselves to start recycling,” he says. Garbage is often still burnt on desert islands. Certainly, the fact that people who might not have seen or communicated with Westerners before are suddenly in daily contact with them has worried many—including politicians. Conservative parties and clerics have protested massage parlours and warned of the dangers of mingling independent tourists with the local Muslim residents. Tourists can rent boats for a few hours on the water. I heard this a few times with regards to the increase in religious extremism. Proportionally speaking, many young men have left to fight with the Islamic State in Syria in the past few years. Security analysts blame ultra-conservative community leaders and preachers, as well as criminality. “You see the changes also in the dresses: the dark dress with the dark veil was not an usual attire for women 10, 20 years ago,” my local couchsurfer points out. And yet, most Maldivians will go out of their way to make visitors feel at ease—even when communication is a problem. As I throw away my empty coconut in a trash bin, the fruit makes a loud noise in the afternoon silence. A group of elder men, sitting under palm trees, try to tell me something in Dhivehi, which I cannot understand. It feels like it has a slightly reproaching tone: “Maybe I was too loud,” I think. Despite several attempts, we cannot really communicate. The Maldives are a place, a beautiful place, of great contradictions and contrasts. There is a contrast between the splurging expense of the resorts, which are often a few miles away from local islands, where families live in a single room. There is a contrast within the society itself, between the growing problem of extremism and the overwhelmingly tolerant and friendly way in which people who have never seen a foreigner until a few years ago interact with tourists, who walk, a bit lost, on their islands. There is a contrast in the way the state applies religion, not according to the way many live. There is a contrast between what wealthy foreigners and what normal citizens are allowed to do. Westerners who travel independently to this country will not be able to find clubs or bars. They will, indeed, find a beautiful sea landscape and a different world from what they are used to. A place of unforgettable contrasts. Serena is a reporter based in Germany. Travel is her passion. She has worked for newspapers, radio stations and television networks in Germany, the United Kingdom and Myanmar.